William F. Stern House receives the Twenty-five Year Award from the American Institute of Architects, Houston Chapter recognizing outstanding architecture of lasting value. Principal David Bucek presents “Old Buildings, New Uses: Adaptive Use Strategies and Case Studies” at the 2017 Preservation Texas, Preservation Summit in Waco, Texas. Senglemann Hall featured in Chron.com slideshow, ”Before-and-after photos show the work of preservationists around the US,” highlighting successful historic tax credit projects in advance of Houston hosting the 2016 National Trust for Historic Preservation Conference. The Menil House is included in an Offcite.org and Houston Chronicle, Gray Matters article, “How Houston stopped tearing down its history,” by Barry Moore. Sengelmann Hall featured in the National Trust for Historic Preservation report, “Federal Historic Tax Credit in Texas: Creating Jobs, Building Communities, Preserving Heritage,” and in an associated Savingplaces.org blog post by Shaw Sprague. “The Weingarten mansion receives landmark status,” featured in the Houston Chronicle, article by Nancy Sarnoff. Principal David Bucek presents “Case Study: Wharton Depot”, during the On The Right Track: Saving Historic Texas Railroad Resources discussion at the Preservation Texas, East Texas Regional Meeting in Marshall, Texas. Rosenbaum Renovation featured in the Houston Chronicle article, “Keeping tracks: A model train set as autobiography,” by Andrea White. Principal David Bucek becomes President of AIA Houston. Principal David Bucek presents “Sustainability and Preservation” with Eva Read-Warden AIA, Bess Graham and Greg Ibanez, FAIA at the Texas Society of Architects Convention in Dallas, Texas. Baker Commons Dining Hall receives a John Staub Award for Historic Preservation from the Institute of Classical Architecture and Art, Texas Chapter. Sengelmann Hall receives an Honorable Mention for Historic Preservation. The Griffith Ranch is featured on Curbed.com national article, “Tour an Energy-Efficient Modern Cabin Masquerading as Traditional Texas Ranch House,” by David Hay. The Weingarten mansion is featured in the Houston article, “Weingarten mansion begins its transformation;” and MySanAntonio.com article, “Weingarten mansion poised for complete overhaul,” by Nancy Sarnoff. Principal David Bucek’s article, “Éminence Grise,” on the history of the Menil Collection campus appears in Paper City Magazine (p.59). Glen Rosenbaum receives a Good Brick Award from Preservation Houston for the restoration of his mid-century modern home in Meyerland; featured in CultureMap Houston article, “Saving history: Historic preservation finally gets its day in Houston with city-changing projects honored,” by Barbara Kuntz. Rosenbaum House renovation featured in the New York Times article ”Coming Full Circle,” by David Hay. Principal David Bucek becomes President Elect of AIA Houston. Principal David Bucek’s article ”Preservation and Parker – The mayor is helping Houston save its past," appears in the Houston Chronicle, Gray Matters. The C. Milby Dow restoration receives a design award from AIA Houston with an accompanying article in the Houston Chronicle entitled “AIA awards honor top designs” by Sarah Rufca. Rosenbaum House renovation is featured on a Preservation Houston / Pier and Beam tour entitled Meyerland Mod. Caddell and Chapman Apartment is featured in a CultureMap Houston article, ”Exclusive hotel penthouse condo brings iconic architect cred and a sky-high $4.6 million price tag,” by Barbara Kuntz. The C. Milby Dow restoration receives a Good Brick Award from Preservation Houston. The Rosenbaum House renovation is featured on the annual Rice Design Alliance architecture Tour and featured in Houstonia Magazine. The C. Milby Dow House restoration is featured in House and Home, with an article entitled ”Applauding the Work of Staub and Stern and Bucek," by Susan Fox. The restoration of the Menil House and the Frame Harper House are listed among Houston’s top homes in Houstonia Magazine, in an article entitled ”Houston’s Top Homes – A insider’s guide to the greatest houses in the city," by John Lomax. The Bleyzer House, Stern House and the restoration of the Menil House and the Frame Harper House are listed among Houston’s top houses in Houstonia Magazine, in an article entitled ”Top Homes: The Experts’ Lists,” by Michael Hardy. Menil Collection’s new cafe featured on Culture Map, Swaplot, and Houston Business Journal. The restoration of the de Menil house is featured in Architect Magazine in an article, ”“How the de Menils and Their Art Museum Changed Houston,” by Reed Karaim. 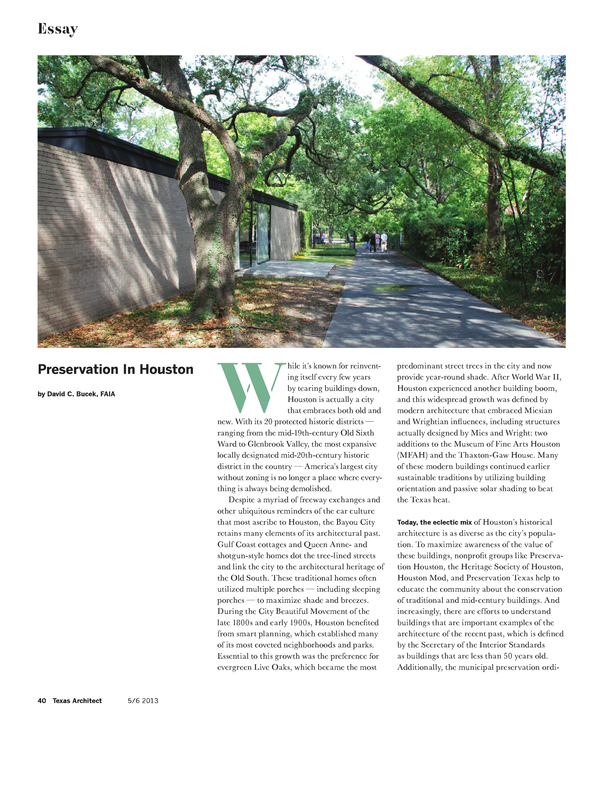 Principal David Bucek’s article “Preservation in Houston" appears in Texas Architects. Bleyzer House is featured on the 2012 AIA Houston home tour with accompanying article in the Houston Chronicle entitled ”House of the American Dream," by Lisa Gray. Frame/Harper house is featured in a Chron.com article on historic preservation by Katherine Salant, Homes Correspondent. David Bucek joins the Heritage Society at Sam Houston Park Advisory Council. Frame/Harper house is featured in the January, 2012 issue of Wohn!Design, a German magazine featuring international works of building and design. Principal David Bucek participates as a panelist for the University of Texas Student Historic Preservation Association Career Panel. Wiess Masters House at Rice University is featured on the annual AIA Houston House Tour. Wiess Masters House achieves LEED for Homes Silver certification. Principal David Bucek is elected to the board of AIA Houston. Principal David Bucek is appointed as a Commissioner for the Houston Archaeological and Historic Commission. Principal David Bucek presents at the Round Top Festival Institute, Library and Museum Collection Forum, with a talk entitled, “Preservation and Advocacy in Texas,” September, 2011. Principals William Stern and David Bucek lecture on the firm’s work at School of Architecture at University of Texas in Austin. Stern and Bucek are appointed guest critics at the School of Architecture at the University of Texas for the fall, 2011 semester. Principal David Bucek presents “Research Approaches to Restoring Historic Buildings," at the Friench Simpson Memorial Library, 4th Annual 3S Genealogy Symposium in Hallettsville Texas. Principal William Stern is elected to the Board of Trustees for the Menil Foundation in Houston. Principal David Bucek is elevated to the College of Fellows at the annual American Institute of Architects Convention, May, 2011. Principal David Bucek is elected to the board of Houston Mod. Sengelmann Hall receives one of eleven Honor Awards from the National Trust for Historic Preservation. Principal David Bucek is elected to the board of Preservation Texas. Sengelmann Hall featured in Texas Architect Reprise of a Classic by Anna Mod . Museum District House featured in the May, 2011 issue of PaperCity. Sengelmann Hall and the Wharton Depot restorations both receive Honor Awards from Preservation Texas. Concept design for Montrose Farmers Market featured in OffCite article, “Montrosian Dreams of Gardens and Farmers Market,” by Raj Mankad. Caddell and Chapman apartment in Houston is published in Luxury Homes by Julie Carpenter and wins a design award from PaperCity and the Decorative Center of Houston. Oshman Engineering Design Kitchen at Rice University wins an Honor Award from AIA Houston. This building is the first structure on the Rice campus to be LEED certified and was rated LEED Gold.